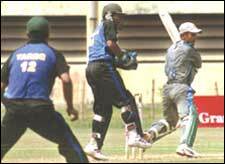 Corporate Night Cricket By Sports UN-Limited is an event that took place between 13-May-2006 and 09-Jul-2006 in Hyderabad. Straighten the slouchy back and loosen the tight-fitting tie. A good sweaty game of wholesome cricket is what all you overworked professionals need. Plus, a little bit of competition on the field (apart from the boardroom) never hurt anybody. Sports Un-Limited has organises a Corporate Cricket Tournament which starts from the 28th of May. Registration for the game closes on 23rd May 2006. Only 20 teams are allowed to participate in the tournament. So, start practice, today. Please contact Nilesh on 99494-90070 for further details. Be the first to comment on Corporate Night Cricket By Sports UN-Limited! Just use the simple form below. fullhyd.com has 700,000+ monthly visits. Tell Hyderabad what you feel about Corporate Night Cricket By Sports UN-Limited!